JR here! During the night we arrived at the second place where we will drill into the seafloor. You may be wondering how the captain knows when we get to each location since the scenery looks the same, ocean in all directions! The ship uses GPS to know exactly where we are. 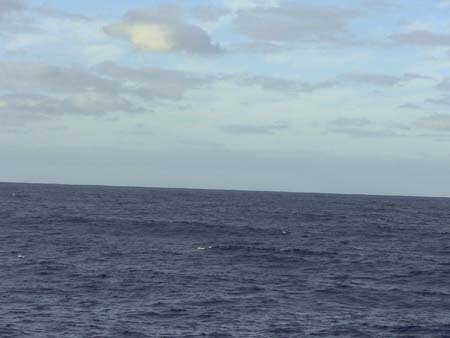 We expect to get the first sediment cores later this morning. It will take nearly 12 hours to lower enough pipe to reach the seafloor. Today, I will tell you a little about one of the scientists on board. His name is Rick Murray and he studies the sediments of the seafloor. He is interested in the chemicals that are in the sediments (muds and clays). These chemicals provide clues to past climates; he can tell where the windblown dust originally came from by looking at the chemical composition of the sediments. Rick is also interested in the layers of microbes within the sediments as they are related to changes in climate conditons of the past.